The Broadway musical Something Rotten! received 10 Tony nominations this morning (April 28), including Best Musical and Best Original Score (Music and/or Lyrics) Written for the Threatre. The musical’s score was penned by Grammy Award-winning Nashville songwriter and producer Wayne Kirkpatrick, and his brother, screenwriter/songwriter Karey Kirkpatrick. Wayne Kirkpatrick earned a Grammy award for Song of the Year in 1997 for co-writing “Change The World,” recorded by Eric Clapton. He has notched songs including “Every Heartbeat,” “Good For Me” (Amy Grant); “Wrapped Up In You” (Garth Brooks); “Place In This World” (Michael W. Smith); “My, Oh, My” (The Wreckers). He is a writer and producer on Little Big Town’s albums Road To Here, and A Place To Land, including hits “Boondocks,” “Bring It On Home,” and “A Little More You.” The musical marks his first foray into musical theatre. Karey Kirkpatrick, a director and screenwriter, has worked on films including James and the Giant Peach, Chicken Run, Charlotte’s Web, as well as contributing to the Smurfs films. 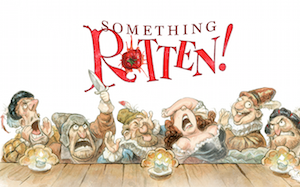 Set in the 1590s, Something Rotten! follows brothers Nick and Nigel Bottom as they set out to write the world’s very first musical, after a local soothsayer predicts the future of theatre will include singing, dancing and acting at the same time. Something Rotten! earned additional Tony nominations for Best Performance by an Actor in a Leading Role in a Musical (Brian d’Arcy James), Best Performance by an Actor in a Featured Role in a Musical (Christian Borle and Brad Oscar), Best Direction of a Musical (Casey Nicholaw), Best Choreography (Casey Nicholaw), Best Orchestrations (Larry Hochman), Best Costume Design of a Musical (Gregg Barnes), and Best Book of a Musical (Karey Kirkpatrick).